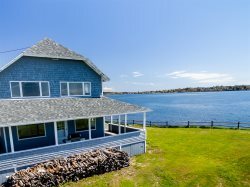 The Channeled Whelk is a quintessential New England coastal cottage, which features a traditional exterior of weathered cedar shake siding along with a completely updated interior and desirable amenities. Perched atop an elevated rise on a remarkable 2.3 acres on coveted Bailey Island, Channeled Whelk offers majestic easterly AND westerly ocean views; easterly over Little Harbor, and westerly across the southern end of Mackerel Cove and out to Casco Bay. The oversized wrap-around porch, with the added luxury of a screened in section, is the perfect spot to begin and end your day! Enjoy your coffee while watching the sunrise each morning, then unwind with a beverage of your choice while savoring spectacular sunsets every evening. The wooded lot offers privacy not often found in the heart of Bailey Island. A gazebo and beautiful memorial gardens are surprising touches that will enhance your overall experience at Channeled Whelk, and the shores of Little Harbor are just a short walk away. Inside you'll find a well appointed kitchen with everything you'll need to prepare a delicious Maine meal, a beautiful sunlit dining room and a cozy living room with comfortable furnishings. This property has 3 bedrooms located on the second floor, 3 baths and a third floor family/bonus room (with potential sleeping quarters). Hardwood floors throughout, modern coastal decor, and an abundance of natural light complete this coastal retreat. As you can see from the photos, the views will not disappoint! Located in the heart of Bailey Island, you will enjoy being just a short walk/bike/drive from all the islands have to offer, including The Giant Stairs Trail (0.5 miles away), Land's End Gift Shop (0.7mi), Library Hall (0.7mi), Bailey Island General Store (0.9mi), Giant Stairs Seafood Grille (0.9mi ), Morse's Cribstone Grill (1.7mi. ), Cook's Lobster & Ale House (1.8mi), Salt Cod Cafe (2.0mi), H2O Outfitters (2.0mi), Island a Candy Company (2.5mi), and several great local beaches and trails. You will also enjoy being just 20 minutes from all the restaurants, shops and pubs of Brunswick. Check-In: Check-in is between 4pm and 5pm on the date of your arrival. If you think you may be arriving later, please contact MaineStay Vacations and we would be happy to make other arrangements for you.